Comedy has always been a film genre slightly looked down upon. It’s not considered as classy and meaningful as a drama or a love story, or as imaginative and insightful as a sci-fi film. Looking at comedies today one can’t help but agree. As funny as The Hangover is, you can’t put it in the same category as Inception; The Dictator has got more disgusting jokes per minute than any other comedy prior to it. Romantic comedies have become a genre of their own, the sentimentality allowing us to laugh and cry at the same time, whilst the brainier part of our body acknowledges the silliness of the entire scenario. However, if we take a look at silent comedies, notably the slapstick genre, we discover a kind of subtlety and intelligent humour that’s missing from movies nowadays. This type of humour seems to have only been revived briefly by comedy geniuses such as Monty Python, Rowan Atkinson, Fry & Laurie and to a lesser extent Mel Brooks. Their time has passed unfortunately and there seems to be no one valiant or talented enough to try walking in their shoes. What’s left for comedy lovers to do is to back to the beginning. It all started with The Sprinkler Sprinkled in 1895 and it peaked with the genius of Buster Keaton. Some may say of course that it is Charlie Chaplin who holds the title of the greatest slapstick comedian of the silent era, but given that Chaplin’s sound films exceed the quality of his silent ones, it would be unfair to limit him to his silent career only and label him as a slapstick comedian. Moreover, Chaplin’s silent films haven’t aged as well as Keaton’s. It is true that, judging by box-office success, Chaplin was the more famous and financially successful one. He was also a good business man. His humour however was fit for a 1920s – 1930s audience. 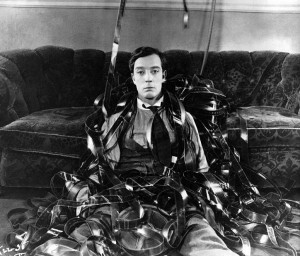 Buster Keaton’s comedy style may have been too subtle and mature for the audience of the day. That may be the reason for which he was hailed as a genius only towards the end of his life, when he was “rediscovered” by a younger, more sophisticated audience. However, at that point he was no longer making movies of the same calibre and he was still seen by some of his peers, Chaplin included, as a bankrupt old man who had to do menial TV appearances for a living. Looking at Buster Keaton’s career, one discovers a man who was born in show business. He wasn’t asked what he wanted to be when he grew up, he just took over the family business at the age of four. He was, of course, a natural, but then again there might have been a great many things he could have excelled at if given the opportunity. One will never know how he would have been as a civil engineer, but the intricacy with which he would build up his gags and even the fact that he designed his own house stand proof that he might have been just as good at it as he was at comedy. Most great directors are said to be/have been perfectionists and that may well be true. There is no other way to achieve greatness. Most of Buster Keaton’s film stand proof of the man’s perfectionism, which was sometimes pushed to the extreme. Many books have been written about his physical abilities and acrobatic skills and in the world of today may even be put into question, if we forget that special effects were in their infancy in the 1920s and that Buster was always one to perform his own stunts. His grace and physical beauty were often compared to those of a butterfly and even the great Orson Welles called him “the most beautiful person to ever be photographed”. Who can argue with that when they’re looking into Buster’s big eyes who never laugh, but express many intense emotions despite him being called The Great Stone Face. It is hard to decide what’s more fascinating about Keaton’s films: his ability to express a great range of emotions while keeping such a straight face, his ability to perform some of the most dangerous and awe-inspiring stunts ever to be captured on camera or his cinematic genius that created some of the best and funniest films of the silent era. To find proof of all of that one needs to look no further than Sherlock Jr. (1924). The gags created for this feature film, the shortest feature he’s ever released, are nothing short of extraordinary and even surrealist filmmakers like Luis Bunuel found inspiration in Keaton’s work. Keaton’s masterpiece, however is considered to be The General (1927). Keaton’s attention to detail is most visible during the production of this film, which made it become one of the most expensive films of the silent era. He would spare no expense and the finished product would become a yardstick to action comedies and chase scenes of subsequent films and in inspiration to future directors. His vision as a director is coupled with his skills as an acrobat and his love for all things mechanical. Where Chaplin would make as much use of his persona and create a relationship between himself and the audience, Keaton would go out of his way to confuse the audience, show no mercy to his screen persona, but stoicism and determination and from this his unique style of slapstick would emerge. Buster Keaton’s life story is no fairy tale unfortunately. He hasn’t got a successful biopic, starring an actor of Robert Downey Jr.’s calibre. He didn’t live the rest of his life as a recluse millionaire in Switzerland. He had to work until the end of his life in mediocre productions, “enjoying” his status as a former silent movie star. He was no astute business man, but a naive artistic genius who got the short end of the deal when he signed with MGM, signing away his creative independence. One can only guess the quality of his sound era productions if he had worked in an independent studio like Chaplin did. Unfortunately that wasn’t the case and he faded into oblivion at the beginning of the sound era. Today he is only hailed as a cinematic genius by film scholars mostly, his legacy being preserved by those few fans who still hold dear the wonderful world of silent cinema.